A HUGE thank you to The Strathearn Historical Park & Museum for inviting us to exhibit some of our purses at The Tiara Garden Party, a fundraiser for the Simi Valley Historical Society. Here's how it looked yesterday in the parlor of The Strathearn House. 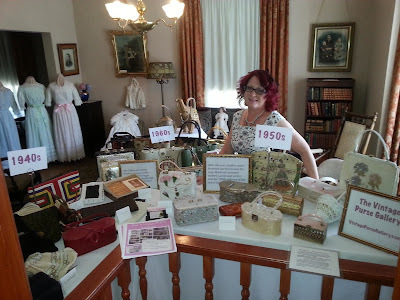 If you are in the Los Angeles or Ventura County areas and would like to speak to Wendy about a purse exhibit or talk, please email info@vintagepursegallery.com.